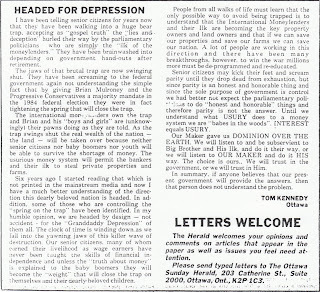 NOTE: I wrote this letter and The Sunday Herald published it on page 17 on July 14, 1985. 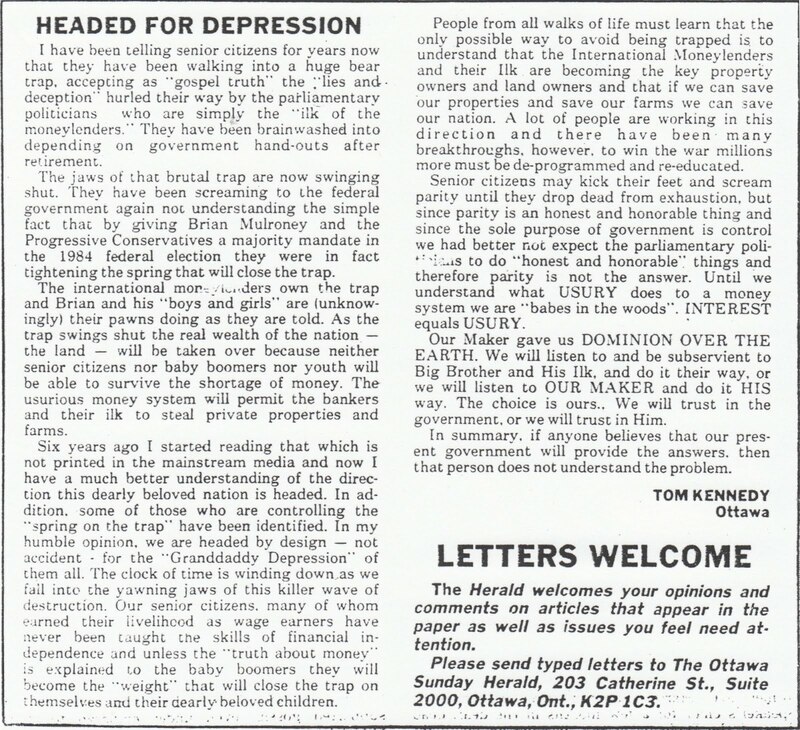 It was titled “Brian and Company are just the pawns” with the subtitle “Headed For Depression.” Not much has changed over the years because Canadians gave Steven Harper and the Conservatives a majority mandate in the 2011 federal election and they are further tightening the spring that will eventually close the trap. “I have been telling senior citizens for years now that they have been walking into a huge bear trap, accepting as “gospel truth” the “lies and deception” hurled their way by the parliamentary politicians who are simply the “ilk” of the moneylenders. They have been brainwashed into depending on government hant-outs after retirement. The jaws of that brutal trap are now swinging shut. They have been screaming to the federal government again not understanding the simple fact that by giving Brian Mulroney and the Progressive Conservatives a majority mandate in the 1984 federal election they were in fact tightening the spring that will close the trap. The international moneylenders own the trap and Brian and his “boys and girls” are (unknowingly) their pawns doing as they are told. As the trap swings shut the real wealth of the nation - the land - will be taken over because neither senior citizens nor baby boomers, nor youth will be able to survive the shortage of money. The usurious money system will permit the bankers and their ilk to steal private properties and farms. Six years ago, I started reading that which is not printed in the mainstream media and now I have a much better understanding of the direction this dearly beloved nation is headed. In addition, some of those who are controlling the “spring on the trap” have been identified. In my humble opinion, we are headed by design - not accident - for the “Granddaddy Depression” of them all. The clock of time is winding down as we fall into the yawning jaws of this killer wave of destruction. Our senior citizens, many of whom earned their livelihood as wage earners have never been taught the skills of financial independence and unless the “truth about money” is explained to the baby boomers they will become the “weight” that will close the trap on themselves and their dearly beloved children. People from all walks of life must learn that the only possible way to avoid being trapped is to understand that the International Moneylenders and their ilk are becoming the key property owners and land owners and that if we can save our properties and save our farms we can save our nation. A lot of people are working in this direction and there have been many breakthroughs, however, to win the war millions more must be de-programmed and re-educated. Senior citizens may kick their feet and scream parity until they drop dead from exhaustion, but since parity is an honest and honourable thing and since the whole purpose of government is control we had better not expect the parliamentary politicians to do “honest and honourable” things and therefore, parity is not the answer. Until weunderstadn what USURY does to a money system we are “babes in the woods.” INTEREST equals USURY. Our maker gave us DOMINION OVER THE EARTH. WE will listen to abd be subservient to Big Brother and His Ilk, and do it their way, or we will listen to OUR MAKER and do it HIS way. The choice is ours. We will trust in the government or we will trust in Him. In summary, if anyone believes that our present government will provide the answers, then that person does not understand the problem."